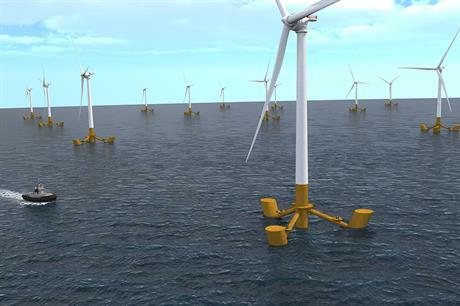 FRANCE: France's first two pilot floating wind power projects have been awarded to Quadran and the Eolfi-CGN joint venture. The government issued call for proposals for floating projects in 2015 to be installed in the Atlantic and Mediterranean. The EolMed consortium, led by French firm Quadran, was selected for its project off Le Gruissan in the Mediterranean. It is set to comprise four Senvion 6.2MW turbines with a 152-metre rotor diameter. Ideol will supply the "damping pool" floating platforms, which will be manufactured by civil engineering firm Bouygues Travaux Publics at Port-La-Nouvelle, on the southern French coast. For the second project, developers Eolfi and China General Nuclear Power Group (CGN) were awarded the Ile de Groix zone off Brittany, northwest France. The project will feature four GE Haliade 6MW machines on a semi-submersible floating platform designed by DCNS to be built and assembled at St Nazaire, west France. Other bids are still being assessed, with further announcements expected in September. It is not yet clear how many projects will be selected nor how much funding each will receive. The selected winners still have to carry out impact studies and obtain all the necessary authorisations. Both EolMed and Eolfi/CGN aim to have their pilots online by 2020.